The holidays are over and I am sure you are all baked out by now, but you might want to reconsider. 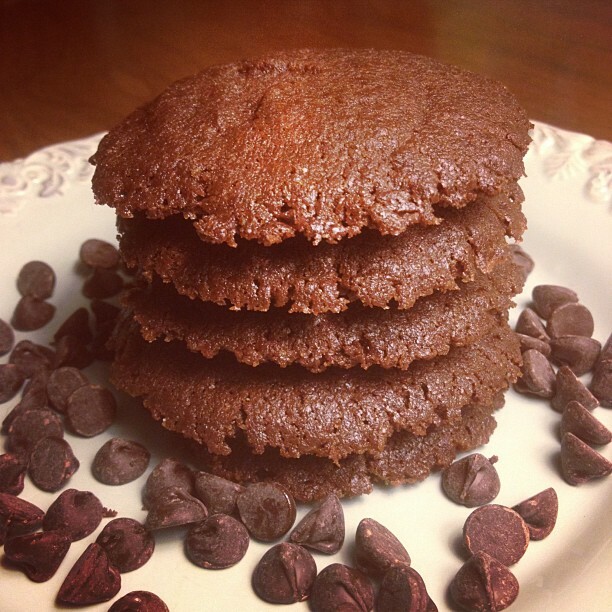 Kristin from Food Fash wanted to share this amazing recipe for Brownie Cookies. These would be perfect for a late holiday gathering or any NYE party! Thanks Kristin! On any given day I could pass by a spread of traditional cookies untempted. But a plate full of brownie cookies? Well, that’s an entirely different story. Using coconut oil in place of butter or other cooking oils adds a unique richness and a complimentary flavor. A brownie cookie made with coconut oil is sure to be a hit amongst cookie lovers and non-cookie lovers alike! Preheat oven to 350 degrees. Mix the dry ingredients in a large bowl until the cocoa powder is evenly distributed. In a separate bowl, mix the wet ingredients. Add the wet ingredients to the bowl with the dry ingredients and mix. The dough will be thick, but keep working it until all of the dough is moist. Form the dough into ping pong sized balls and place on an ungreased cookie sheet. Make sure you have a decent amount of space between each ball to allow for them to flatten as they cook. Bake for 12-15 minutes. Allow cookies to cool completely before removing from the cookie sheet. Sorry, but I have to ask – who goes through the work of making cookies to make only 12 cookies? They would be gone in less then 30 seconds in my house! This recipe is perfect for my house of only two people, but feel free to double or even triple this recipe for a larger family. Your family will love them!